Meetings take place the 3rd Wednesday of the month. For more information, contact phoenix@joeniekrofoundation.org. Meetings take place the 2nd Wednesday of every other month. For more information, contact losangeles@joeniekrofoundation.org. (For validated parking, please park in Lot #4 located on West Third St. between San Vincente and Sherbourne Drive (north side of the street). Meetings take place the 2nd Tuesday of the month. For more information, contact RiversideCA@joeniekrofoundation.org. Meetings take place the 4th Saturday of the month. For questions or more information, contact sacramento@joeniekrofoundation.org. 2019 Meeting Dates: Coming Soon! Meetings take place the 3rd Sunday of every month. For more information, contact sandiego@joeniekrofoundation.org or call Carol Stout at (951) 445-1691. In alliance with The Aneurysm and AVM Foundation. Please join us for our Bay Area Support Group locations on the 1st Thursday of every month. For more information, contact sanfrancisco@joeniekrofoundation.org. Meetings take place the 2nd Monday of the month. For more information, contact denver@joeniekrofoundation.org. Meetings take place the 1st Wednesday of the month at Littleton Adventist Hospital. For more information contact littleton@joeniekrofoundation.org. Meetings take place every other 3rd Wednesday of each month. For more information, contact washingtondc@joeniekrofoundation.org. Meetings take place the 3rd Tuesday of the month. For more information, contact jacksonville@joeniekrofoundation.org. Meetings take place the 1st Tuesday of the month. For more information, contact miamifl@joeniekrofoundation.org. Click here to download flyer. Click here to download Spanish flyer. Meetings take place the 4th Wednesday of the month. For more information, contact westpalmbeach@joeniekrofoundation.org. To RSVP, call (866) 236-5933. Meetings take place the 1st Tuesday of the month at the Kennestone Hospital Outpatient Rehab Center. For more information contact atlantaga@joeniekrofoundation.org. Meetings take place the 3rd Wednesday of each month. For more information, contact 815-725-7133 ext. 3163. Meetings take place the LAST Thursday of each month. For more information, contact portland@joeniekrofoundation.org. Meetings take place the 1st Tuesday of the month at Massachusetts General Hospital. For more information contact boston@joeniekrofoundation.org. Meetings take place the 2nd and 4th Wednesday of every month except the Wednesdays during the week of Thanksgiving and Christmas. For more information, contact stlouis@joeniekrofoundation.org. Meetings take place the 4th Thursday of the month. 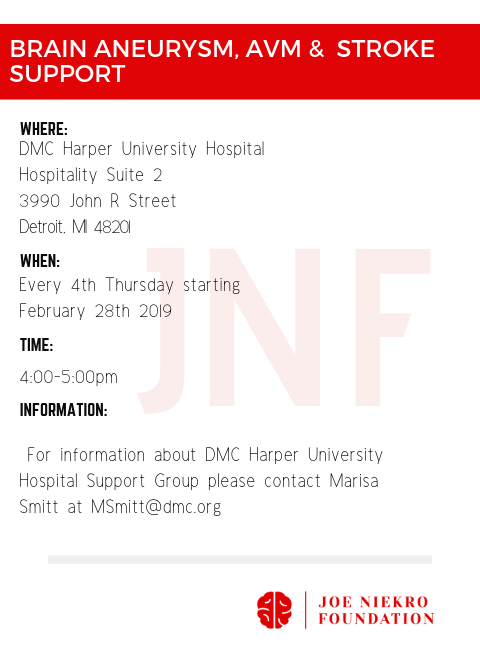 For more information, contact MSmitt@dmc.org. Meetings take place the 1st Wednesday of every month. For more information, contact wyomingmi@joeniekrofoundation.org. Meetings take place the 1st Wednesday of every month. For more information, contact saginaw@joeniekrofoundation.org. Meetings take place the 2nd Monday of the month. For more information, contact RomeNY@joeniekrofoundation.org. Meetings take place the third Monday of each month. For more information, contact syracuse@joeniekrofoundation.org. Meetings take place the 1st Thursday of the month at the Carolina Neurosurgery and Spine Associates. For more information contact charlotte@joeniekrofoundation.org. Meetings take place the third Tuesday of each month. For more information, contact winstonsalem@joeniekrofoundation.org. Meetings take place the 4th Thursday of the month. For more information, contact toledo@joeniekrofoundation.org. Meetings take place the 4th Tuesday of the month. For more information, contact oklahomacity@joeniekrofoundation.org. Meetings take place the 3rd Tuesday of each month. For more information, contact tulsa@joeniekrofoundation.org. Meetings take place the 3rd Tuesday of the month at Rhode Island Hospital. For more information contact ProvidenceRI@joeniekrofoundation.org. Meetings take place the 2nd Wednesday of the month at the Medical University of South Carolina. For more information contact charleston@joeniekrofoundation.org. Meetings take place the 3rd Thursday of the month. For more information contact ColumbiaSC@joeniekrofoundation.org. Meetings take place the 1st Thursday of the month. For more information, contact johnsoncitytn@joeniekrofoundation.org. Meetings take place the 4th Thursday of every month from 6-7 PM. For more information, contact rochelle.brozgoldready@UTSouthwestern.edu. The Joe Niekro Foundation Stroke And Aneurysm Support Group, STARS (Steps Against Recurrent Strokes), at our partnering hospital, Kingwood Medical Center. The group meets the 3rd Monday of every other month from 6-7 PM in the community room. For more information, contact kingwood@joeniekrofoundation.org. 22999 US Highway 59 N.
Meetings take place the 3rd Tuesday of the month. For more information, contact houston1@joeniekrofoundation.org. Meetings take place the 2nd Monday of the month. For more information, contact plano@joeniekrofoundation.org. Meetings take place the 2nd Thursday of the month. For more information, contact saltlakecityut@joeniekrofoundation.org or call 801-587-9935. Meetings take place the 2nd Tuesday of the month. For more information, contact newportnewsva@joeniekrofoundation.org. Meetings take place the 2nd Tuesday of the month. For more information, contact richmond@joeniekrofoundation.org. Meetings take place the 2nd Tuesday of the month. For more information, contact TacomaWa@joeniekrofoundation.org. 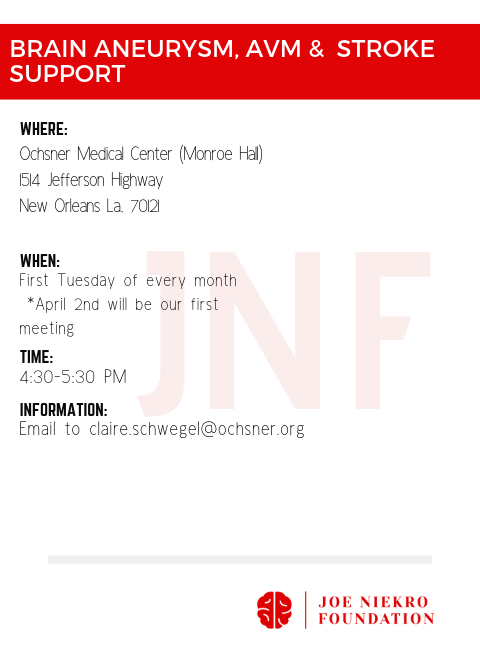 Meetings take place the 1st Tuesday of the month, starting in November. For more information, contact huntingtonwv@joeniekrofoundation.org. Meetings take place the 1st Thursday of every month. For more information, contact saskatchewan@joeniekrofoundation.org.